the same type of soil, and placed them side by side on a windowsill so they would receive adequate sunlight. Then he fed plant A water previously heated in a microwave and Plant B water that was heated on the stove. Now, before you start thinking that this experiment was faulty before it even started, know that the water came from the same source and was filtered before going to either plant. Also know that both the microwaved water and the stove top water was left to cool before going to the designated plant. Here is what happened. By day three, it was already clear that the plant receiving the microwaved water wasn't doing very well. It looked wilted and tired. By day five, it was obvious that something needed to be done or the plant receiving the microwaved water was going to die. The other plant, the one receiving water heated on a stove, was healthy and growing. By day seven the plant getting microwave water was reduced to stub, and by day nine, it was all but dust and a brown stalk. Interestingly enough, the other plant was still growing strong. Okay we understand that you’re probably not planning on feeding your plants microwaved water; however, this experiment brings up an interesting thought: If microwaved water can kill a sapling, what is it doing to our own bodies? In a century where we put everything from tea to popcorn to leftovers in the microwave, how do we know that we’re not slowly harming our own bodies? It's definitely a topic worth exploring, in our opinion! Think its all a load of crock? Go ahead and try this experiment yourself. 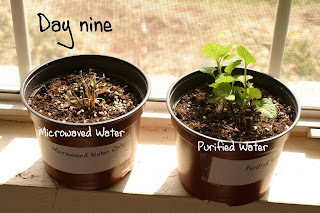 All you need are are two pots, some soil, two hearty plants, some sunlight, and a microwave. Good luck!